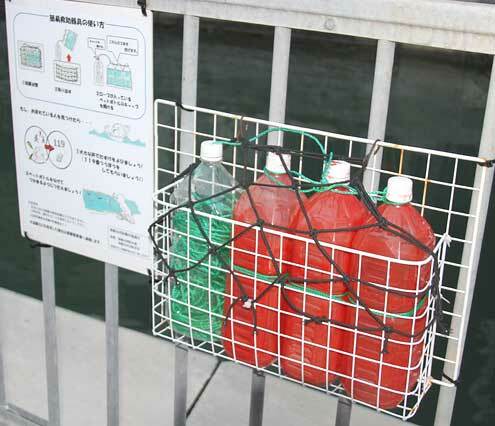 Simple rescue tools made of PET bottles placed along the bank of Shiowatari river at Maejima, Naha. PET bottles have saved a man who fell into a river in Naha. At 0:28 p.m. on February, Naha City Fire Headquarters received an emergency phone call from a citizen. He said, “A man fell into the river.” He noticed the man when he was walking on a road along Shiowatari River at Maejima in Naha. He threw the PET bottles to the drawing man, following instructions by firefighters. The man grabbed the bottles and waited for the arrival of rescue members. He was transported to a hospital by an ambulance, but was not in a life-threatening condition.